Toronto, Ontario -- November 27, 2017 -- As new technologies change the landscape of the repair industry, increased dialogue among repairers, OEMs and insurers is vital for the longevity of companies within its ecosystem. 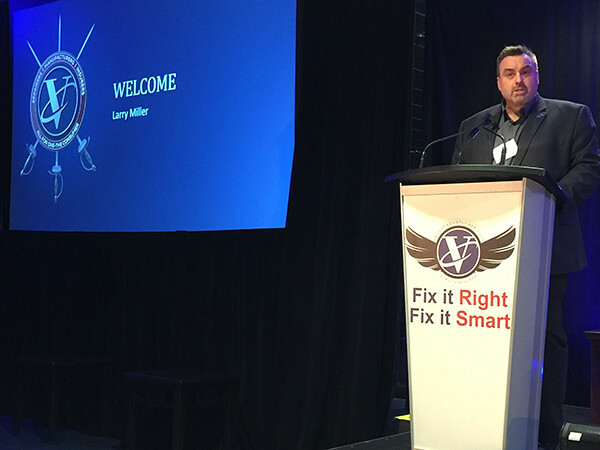 A packed audience of more than 120 industry stakeholders heard this message at the inaugural Canadian VeriFacts meeting, held at Toronto's Woodbine Racetrack. Key figures presented on different subjects, but the overriding message was that more communication is needed if customers are to receive the best possible repair. Sean Carey, President and CEO of SCG Management Consulting, claimed OEMs are now re-entering the market and providing “much needed” industry support. This comes after insurers led the direction of the market for some 20 to 30 years. The advent of new technology is driving this change. “The economics currently drive every decision in the ecosystem. We need to be driven by the proper repair and safety of the customer. I think this will come with advanced technology,” he said. Repairs, OEMs and insurers were put out of their comfort zone, in a bid to help them improve the way they run their business. Farzam Afshar, CEO of VeriFacts Automotive, said: “The limit of what we know is in our comfort zone, but the answers to our challenge of safe and smart repair do not lie in what we already know and are comfortable with. Being uncomfortable is required in order to invent our next-generation collision industry. An industry where repairers, insurers, OEMs and other constituents can all work together and focus on the consumer and a thriving future." George Avery, former claims consultant for State Farm, kept attendees on their toes with his industry insight and sense of humour at the full-day meeting. Throughout the event he gave the audience his top five tips for not just running a business, but also living their life. These included: It's not easy; practice; be a resource (for potential customers); be kind; and appreciate your family, friends and colleagues. Carey gave a particularly interesting presentation on the progress of autonomous vehicles and how OEMs will start to drive the industry in the near future - not insurers. OEMs failed to participate in the industry over the past 20 to 30 years, which allowed insurers to invest in alternative parts and lead the direction of the industry. This is now changing as the OEMs invent new technology and re-enter the market, claimed Carey. Increased autonomy and other automotive technologies could allow OEMs to know much more about what is happening with their vehicles. The audience heard from Carey how in the future it may be possible for OEMs to insure vehicles and sell consumers a service, rather than just a product. OEMs would direct consumers to specific repair shops, making it vital for repairers to build a relationship with OEMs. Repairers will find it increasingly more difficult to repair cars as technology progresses, but those who survive will reap the rewards, claimed Carey. “Repairers want to repair properly and do it anyway, even if they are not compensated properly. This will become harder as cars and technology become more complex and rigorous training is required to keep up. Those that survive will see an improvement in margins,” he said. Fresh from his presentation at the Pfaff Open House, Mike Anderson, of Collision Advice, gave a presentation on the importance of technology with a look at telematics. This technology gives a vehicle real-time alerts and diagnostic information, reducing the severity of vehicle accident injuries. “It’s not a case of if this will be introduced to the market, but when," claims Anderson. This new technology will completely change the way collision repairers will be required to operate their business, and adhering to OEM specifications will become key. Surprising many in attendance was an OEM panel. Hosted by Carey, the discussion featured David Adams of Global Automakers of Canada, Michel Matte of BMW Group Canada, Paul Stella, of Toyota Canada and Scott Wideman of VW Group Canada. Many in the audience were surprised when the OEMs invited repairers to contact them if they had problems in regards to a repair or an insurance estimation. This backed up the point that the industry was open for increased dialogue. OEMs want to hear from collision repairers and the challenges they face with insurers or when following OEM specifications. Carey claims OEMs are a “terrific resource.” He added: “They want to hear from you, but they are not called on enough." OEMs in attendance claimed they were working on ways they could improve the usability of their websites, in a bid to make it easier for repairers to access OEM repair procedures. Wideman said: “We are working on digitizing and other ways to make the experience more user-friendly. There will be changes in the coming years.” OEMs also said they were making a strong effort to reach out to insurers. VeriFacts' motto of “fix it right, fix it smart," was also a key message throughout the day. The maxim encourages collision repair shops to follow OEM procedures, giving the best possible service to the customer while helping to “save lives." A panel of repairers looked at some of the most challenging aspects of the business they face each day. It featured: Claudio Chiodo of Fix Auto Doublesee Enterprises; Shane Goller of P.A. Autobody; Jean-Marc Julien of CARSTAR, Jeff Labanovich of CARSTAR Oshawa Drake Street and Kelly Roberts of Fix Auto North Bay. Common challenges included the time-consuming nature of researching OEM procedures (which many agreed should now be a full-time paid job), technician training, encouraging women into the sector and changing technology. Repairers need to constantly evolve or risk being left behind, was the overall message. “Just because we fixed it right today doesn't mean there's not a faster and more cost effective way to fix the same part next week," said Labanovich. All of the shop owners agreed that it was an exciting time for the industry and that the repairers who “fix it right, fix it smart” will be the ones rewarded by the end. Avery and Roger Wright, CEO of Vector Squared, led an insurance discussion, where they talked about ways repairers can cut down on costs. “Fixing it right, fixing it smart” can cut 2 percent off the estimate for repairers, whereas cutting down on staff “only leads a business to lose its best employees." Advanced driver assistance systems (ADAS) were reviewed, and how features such as ABS have made it increasingly harder for the insurers' claim investigations. Increasing autonomy in vehicles is also confusing the boundary of who's liable for vehicle error. Carrie Kish, Partner and CEO of Culture Sync, spoke on ways collision repairs can improve the dynamics of their business. An eight-and-a-half year study from Culture Sync found better performing companies had a better culture and work environment. “By improving your culture, you can get significantly better results,” she said. Working together to change the industry and the way it operates is vital, finished Kish. More information about VeriFacts can be found at verifactsauto.com.